This blog was written by our member and frequent sour brewer, Ben Martin. Enjoy! Are you a fan of sours, but don’t have the time and space to commit to 3 years? Afraid of infecting your clean brew house? Want to get out of the pale lager rut? Are you looking for a way to appease the hipster cult that lives next door? Well then this guide is for you! If not, keep reading you might learn something, maybe. This guide is simply a breakdown of the process I use to brew kettle sours on my system. I am by no means an expert. Your experiences may vary from mine. Words of warning, if you plan on attempting this, then you are making sour beer. This process limits your risk of infecting your brew house, but only if you practice good sanitation. Second, sour beer is more of an art than a science. Don’t be afraid to dump bad batches. Kettle souring is much like performing a normal brew day with a few added steps in the process. Equipment-wise, if you can brew a clean beer, you most likely have everything you need to brew a kettle sour. The one piece of equipment that is required/highly recommended is a pH meter. You will want to measure the drops in pH during the kettlesouring process. Kettle souring begins like a normal brew day. Perform your mash as you normally would. Personally I brew BIAB (Brew In A Bag). I perform a 70 minute mash on an induction burner keeping my mash around 150°F. After the mash I squeeze my grain bag to free up as much wort as possible. The next step is the kettle souring step. During this step is the only chance to contaminate your brew house. Bring your wort to a brief boil to sanitize the wort and kill off any unwanted yeast or bacteria naturally present in the wort. After a brief boil chill the wort down to 100°F. Pre-acidify the wort to a pH between 4.2 -4.5. 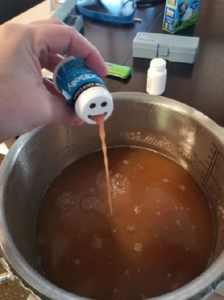 This will help prevent unwanted bacteria from growing in your wort and creating off-flavors. Pitch a pure lactobacillus culture and seal the kettle. Wait for the terminal or desired pH to be reached. 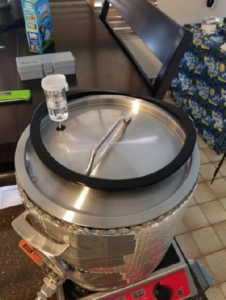 Anvil Brew Kettle with Ferment in a kettle gasket. My kettle souring step looks like this; after the mash I bring my wort to a boil for 15 minutes. I then chill the wort to 110°F. I measure the pH and pre-acidify the wort to pH 4.2. During this step my temperature naturally falls to my target pitch temp of 100°F. Then I spray StarSan around the inside of the kettle and on the lid. 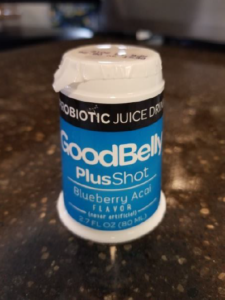 I pitch a Goodbelly Probiotic Shot. This contains a pure culture of lactobacillus planetarum. Then I seal up my Anvil kettle using the fermenter conversion kit. I let my kettle temperature free fall to room temperature over 3 days. By then my terminal pH, normally 3.6, has been reached. Anvil Brew Kettle sealed for souring. After you reach your terminal pH, it is time to resume your normal brew day. Bring the soured wort up to a boil, add hops according to your recipe, chill and pitch your yeast. 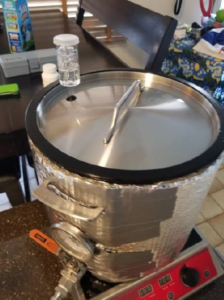 This boil sterilizes the batch and kills the lactobacillus. This allows you to use your clean cold side equipment for the batch. Due to the low pH of the wort, yeast will experience acid shock. It is important to note that you need a large and healthy yeast starter to pitch. 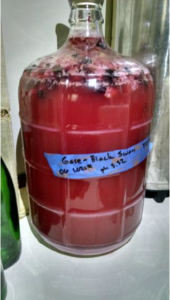 Gose with blackberries and raspberries. The rest of my process works as such; I bring my soured wort to a boil for 15 minutes. Add a small dose of hops to reach around 8 IBUs. Chill the wort to 72°F and pitch yeast. I normally chose Imperial A20 Citrus for all my kettle sours. I then let the fermentation ride. I do not have temperature controlled fermentation. If I plan to add fruits, I will typically add them towards the end of active formation on the 5th day from pitching yeast. The fruit will sit for a week before kegging. I normally target 1-2lb of fruit per gallon. 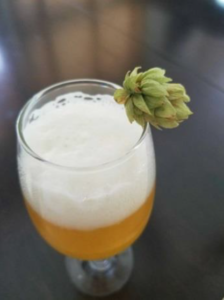 Dry hopped kettle sour with hop garnish. As I stated, I am not an expert. There are plenty of people who know more about this than I do. Here are a few of the best sources for more information on kettle sours and sour beer in general.